Every wedding needs great wedding planning, but we couldn’t do our job without the support of some of Spain’s best providers, suppliers and entertainers. So we thought what better way of sharing their great talent with you than featuring interviews with them on our blog. 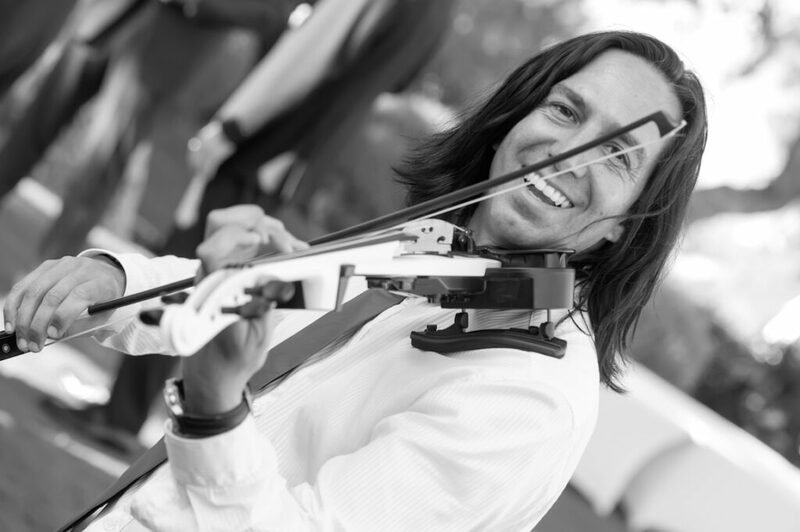 Sunshine Weddings met up with the talented Spanish violinist Quike Navarro who has been wowing audiences world-wide (and many of our wedding couples) with his electric violin performance for over twelve years! Quike is a highly acclaimed house violinist, showman and entertainer – but we wanted to really get to know the man that all the clubs and event organizers have been raving about. We found out why Quike loves learning new instruments, traveling and any sport that involves balancing! Hi Quike, thanks for having a chat with us today. No, thank you! I’m excited to be one of your first interviews. I’ve always had so much fun playing for your wedding parties. You are a world-renown musician and have travelled the globe performing with your electric violin to thousands of people. Where did your interest in music come from? I was born wanting to play the violin. At the age of 10 I finally convinced my parents to buy me my first violin…and from then on there was no going back. I studied piano for 8 years at the Conservatory of Valladolid, which is my hometown in the Northwest of Spain. Plus recently I learned how to play the double bass on my own. Most of the Costa Del Sol know you through dance clubs, but when Sunshine Weddings first met you 8 years ago you were playing with the Malaga Symphony. Tell us more about that. I’ve been collaborating with the Malaga Symphony for the last 8 years but I’ve also performed with different orchestras in Spain, Portugal, Germany, Switzerland, and the US since 1999. But you are right; a lot of my shows are in nightclubs and crazy venues around the world. I have a lot of fun! When did you start playing dance clubs? My first experience of playing my electric guitar performance in a nightclub was in Madrid in 2007 in a place called Gatcha. That same year I started performing on Costa del Sol and have since played at really cool venues including Nikki Beach, Starlite Festival and Ocean Club. Which residencies in Marbella do you have? I’m a resident violinist at Nikki Beach Marbella since June 2012 and the La Sala Group since September 2010. In the UK I play at least once a month, mostly for private events. I’ve also traveled with my electric violin to Italy, Cyprus and Morocco. Plus I endorse for Yamaha Iberica in Spain and Portugal promoting their instruments that I’ve been playing for 15 years. What does a violinist do when not playing? Other than recording new tracks, updating my webpage and installing more lights to my bow, I love sports. I love anything that requires balance like skating, surfing, snowboarding or skiing. I also enjoy technology and science fiction. What stands out as your best and most memorable performances? They are all amazing in their own special way…whether it’s crowds of thousands or small private events. I just love the interaction with the audience, being on stage, the lights on my violin and getting to share my unlimited energy with my fans. I’m one lucky man!